The Hardrock Hundred Mile Endurance Run (also known as the Hardrock 100) is one of the most grueling 100 mile ultra marathons in the world. It is 100.5 miles in length, a total elevation change of 66,100 feet (33,050 of that being the climb), and an average elevation of over 11,000 feet. Each year, runners from all over the world participate in this beautiful yet gruelling race. To even be considered for this race, you must qualify with another 100 mile race. Once you qualify, you are then placed into a lottery where only 145 runners get in. And, once the race begins you have exactly 48 hours to complete the course. 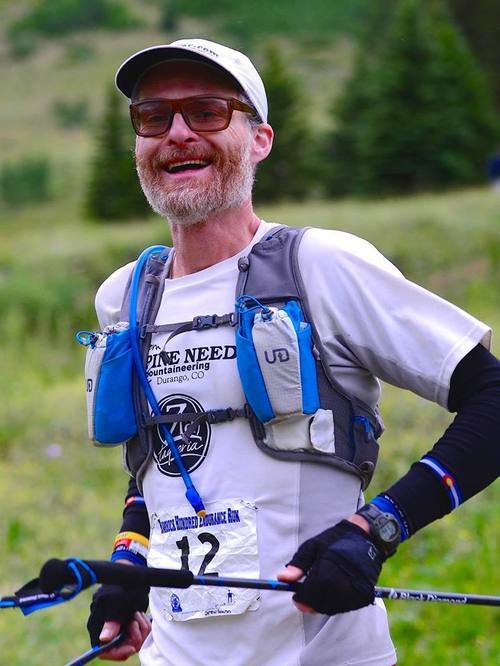 Pine Needle Mountaineering’s very own, Drew Gunn is running his 7th Hardrock this year (July 20-22, 2018). We are thrilled to have sat down with Drew prior to the race. He offered his very inspirational perspective and how he got to his seventh Hardrock. What made you want to run the Hardrock and what was your running progression along the way? My whole progression in running ultras was with the idea of getting into Hardrock. I learned about Hardrock the summer of 2009. I had done some running before, but nothing on this level, and at that time had never run an ultra. I really wasn’t interested in running 100 miles, but running the Hardrock is different—It’s more of a mountaineering race. The amount of vertical you’re running, the fact that you’re above tree line and hike a lot, and there’s a 14er that you go over. It’s a much different race than a normal 100 miler and that was really intriguing to me. I started training with the specific idea of trying to get into Hardrock, rather than just running a 100 miles. In 2010 I ran a local 50 miler to try it, then ran the Leadville 100 and missed the cutoff by 6.5 minutes. I learned a lot figuring out where that 6.5 minutes went. And although it wasn’t a Hardrock qualifier, it at least gave me the confidence that I could run a 100. And so, the next summer (2011), I ran the Bighorn 100 in Wyoming and the Bear 100 starting in Utah and finishing in Idaho that same year. At that point, as much as I started doing this because I wanted to run Hardrock, I realized I really started to enjoy mountain running. I enjoy the head trip and the culture. I started doing some other races because they seemed like good races to do, especially Bear. After you ran your first two 100 mile races, was the Hardrock that much more mentally hard to train for? I find Hardrock easier to train for mentally and physically because it means so much more to me. The course is beautiful and it’s easy for me to train on because it’s local. I also paced in the 2010 Hardrock for a friend and in 2011 I was an aid station captain for the very last aid station. I got to see more of the race and get to know it better. When I started training I put in more time and added more vertical, but to me training feels like playing. It’s not drudgery or difficult for me to get out and train. I really enjoy it. I’d do long days in the mountains and get to know the course. The more you’re exposed to the ups and downs, the more you can figure out things like your fueling, how to handle the weather, what socks don't give you blisters, etc. I got more dialed in, in very specific conditions, and those are the conditions I love. I love being in the alpine, I love thunderstorms, I love wind. So, you’re saying, you love being wet and cold? Yes (laugh). A little bit. I just really love being in the mountains and it’s easy for me to be out there and go through that stuff when I love it. What is the longest distance you generally run in your training? I have topped out at about 38 miles. I also ran a good number of 15-20 milers. I don’t think I ever topped 40 on a training run. What did you do to improve your mental game? Or did you just work through it? I kind of just worked through it. One thing I figured out, and I’ll give my wife a lot of credit for this is, I became a horrible person at my first 100 in Leadville. I became mean, grumpy and angry. It was probably partially due to low blood sugar. But in retrospect, I hadn’t eaten enough and I was very unpleasant. And she was pacing for me and basically told me “If you’re going to be like this, I’m not helping out anymore.” I realized that I signed up for this, I’m here of my free will, and if I’m not enjoying it, I need to do something different. I learned to “fake it till I make it” on mental attitude. No matter how bad I feel or things seem to be going, I’ve learned to put on a smile and be outwardly nice. It makes a big difference. It’s easier at Hardrock because I really want to be there. When I ran the Bear 100 I had a breakthrough and figured out how to stay in the right mental space and be positive about it. I’ve had very difficult moments at Hardrock, but I’ve never questioned why I was there, like I had at other races. I’ve been miserably cold, hobbled by injury, had a lot of difficulty at Hardrock, but it’s never felt wrong or that I should stop and do something else. What are your expectations for this race? No expectations, I just want to finish. I always go in with time goals, but not at the expense of finishing. I’ve seen people chase a time goal and blow up. I’d rather finish slow than shoot for an unreasonable time goal and force it. I would love to PR (personal record) and go faster than I ever have before. But, most of my times are pretty consistent, so we will see. Also, I’d like to avoid going into the second night. I haven’t had to see a second night yet, and I’d like to keep it that way because it sounds rough! I’ve seen what people look like going through that second night and it seems like a rough time out there. How do you feel about how you’ve had to train this year due to the 416 Fire, here in Durango? At the time I was pretty miserable about my training, thinking it would put a dent of things. Now, in retrospect, I think it worked out well. It tested my resolve and made me ask myself if I really wanted to do this. It also made me creative and I did beneficial workouts that I normally might not have done. For example, I ran a flat gravel path that I never run, but I think it helped my turnover. I was also doing weighted step ups in my living room when the smoke was bad. When I could get out of town, I also did a lot of backpacking. I get my pack lightweight and run a little bit while I’m out there. It gives me strength from the extra weight and it makes me resilient. Increasing the chance of finishing and being able to withstand the vert. What is your favorite thing about the race after running it 6 times? When I started, admittedly it was not for the most pure of reasons. I originally just thought it would be badass to finish. The Hardrock was the kind of thing that was really impressive to me. I thought people who had done it were impressive and I really wanted to impress myself. At first I didn't think I could do it. I’ve proven to myself that I can. And I was initially blown away by doing it. Now, I am less and less impressed with myself as time has gone on. What keeps me coming back and is the most important part of it, is the community. I could go out and run that course any time I want. The course is beautiful, it’s amazing and that’s a big reason that it’s a popular race. But for me, it’s the interesting group of people, the runners, the aid station people, the board of directors, the communications people. It’s a really amazing assortment of people that come together for the race. It’s essentially a family reunion and I really love seeing these people and just hanging out with them. There’s something very special that happens out there. These interactions that you get, that I don't think you get unless you’re really really tired—when you're in that state of sleep deprivation. You lose a lot of those filters in your brain when you’re in that state. You get a lot more honest and aware of things. I’ve had really, really small things happen that mean so, so much. A good example of this happened in last year’s Hardrock. I came into an aid station without a crew and only a drop bag. I was expecting to come in on my own. There were two past Hardrock runners that were crewing for another runner. They asked me if I had a crew and I said “no, I’m good”. They took care of me. I was almost in tears. It was such a nice gesture. Because they've run it, they knew exactly what to do. They knew what to say, refilled my water, helped me sort my drop bag. And they were just really nice guys. There’s this community feeling you get that means a whole lot to me. My fastest years may be behind me and that’s fine, but I keep coming back for the people. How does it feel to compete with the world-famous incredible runners (for example, Kilian Jornet), running this Race ? I am not competing with them at all (laughs). We stand on the start line together and they are off (laugh). It’s really cool. It’s a big complement to the race, that someone such as Kilian Jornet’s stature runs this race. He goes out of his way to jump through the hoops you need to jump through, to get into the race and is given no special treatment. He does it just like everyone else. When he comes to Hardrock he understands the race. Watching him smile and see how much he loves the wildness of the course and see how low key it is, is great. He’s at the finish line to watch the last few people come in. He gets it and enjoys it just as much as everyone else there, and the camaraderie that is included with the race. It’s really neat to be able to stand on the starting line with Kilian. I’ve met a lot of really amazing men and women that run this race that I have a lot of respect for. How many years do you plan to run the Hardrock? I don't have a plan, but 10 is a big number in the Hardrock world. I won't deny 10 has a really nice ring to it. It’s a potential goal, and I would love to run 10. But I don't want to focus on it too much because I know every year that I’m capable of starting this thing is a gift. I could get injured, other life circumstances come up. I’m going to give that spot away if I feel like I am not in shape or can no longer run it. When it starts to feel redundant or I’m no longer enjoying it, I’ll just go volunteer. I still want to be involved and I’ll find something I can do to volunteer and stay involved in the race in some way, shape, or form. Do you have an advantage over other runners because the race is in your backyard? Absolutely. More adapted to altitude. Less likely to make a wrong turn, there are a lot of advantages of getting to train on that course all of the time. I know it really well. Before I had gotten in, I spent a lot of time out there. There are a lot of trails on that course that are beautiful and I’ll go out to certain sections over and over just because of the scenery. What would you like to tell people about this being your 7th race? I guess I’d say, just don’t be that impressed. There are people who are much more impressive out there. I do this because I love it and have a lot of fun out there. The thing that gets overstated about Hardrock is the burliness. Everybody likes to talk about how high the altitude is, or how much vertical there is. They say it’s like going to the top of Everest from sea level. They say all of this stuff. The happy go-lucky parts need to emphasized like the beauty of the wildflowers, the comradery, the helpfulness of the aid stations and volunteers. It can be a brutally hard race and be uncomfortable at times, but there are much harder things out there as far as endurance activities. And I think it just needs to be celebrated for its joy and it’s fun. A lot of people get caught up in the difficulty and there’s so much more to it. Any advice for first time runners? Enjoy it. Whatever comes. No matter how bad it gets, remember that’s what you signed up for and have fun. Revel in whatever it is. The beauty. The pain. The crazy storms. Revel in the intensity of the opportunity you have. We’re really lucky. There are a lot of people that don’t get to do this who want to. I’m really lucky to be out there. We're planning a follow up interview and post-race recap with Drew after the Hardrock. Be on the lookout for another interview in a few weeks. Altra running shoes, Black Diamond poles, Suunto watch - all can be found at Pine Needle Mountaineering.